[miau] Looking old-fashioned does not need to indicate stodginess, and a new game has come out to prove this. Big Time Gaming put out on the Quickfire platform a classic-looking slot called Lucky Streak. Lucky Streak came out in April of 2014, and has earned high reviews since. This is a game with the traditional fruit symbols such as cherries, lemons, plums, bells, grapes, melons, and oranges on its reels. The animation used tries to replicate the traditional slot game look you might find in a dive bar somewhere. Despite this theme, the game has quite a few innovations. It has 20 lines and 5 reels, and you have to use all 20 lines at once. The betting starts with coins that are $0.01, and the coin sizes go up to $1 a coin. Only one coin can be staked per game. It has autoplay and the chance to get up to five double or triple bars on a payline that is worth 750x what you staked on a line. Sadly, the prizes aren’t progressive, but the base game jackpot is 10000x. There is an interesting twist on the multipliers. After each spin completes, a number appears next to some of the symbols. The sum of these numbers causes the Cash Stoppa to be moved up that number of spaces. The Cash Stoppa is a stack of multipliers on the right of the reels. If you get 6 or more, you win for that round the multiplier shown. A 7 wins 15x, 8 wins 20x, 9 wins 25x, and 10 wins 30x. Get 11 or more, and you can get on the Cash Stoppa trail. 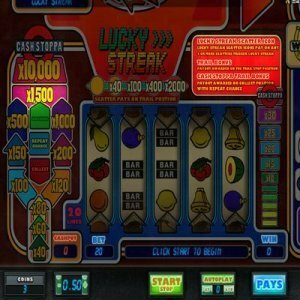 The Cash Stoppa trail is an oval on the left of the reels that is marked with the multipliers, resembling a really colorful wreath. This can net you 40x to 10000x your line bet. You press the ‘Stop’ button to stop the light as it goes up the Cash Stoppa trail, at which point the ‘Collect’ arrow will tell you what your multiplier is. It will also tell you if you Advance, Repeat or Collect. If you get Advance, you move up the trail to bigger multipliers. If you land on Repeat, you get to play the feature again. Hitting on Collect can be the best part as you are given your prize. It can also be a disappointing part as it ends the feature. There is even a ‘Repeat Chance’ spot that can light up and give you the opportunity for bigger prizes. Unusually for this sort of game, it also uses a scatter. The game uses its own game symbol for it. If you get 3 scatters, you get 100x your bet and you are transitioned to the Lucky Streak bonus set. The transition is done neatly, too. There you will get 15 free spins, with a new symbol standing for a wild. It’s the Horseshoe and it only appears in the bonus round. The wild symbol can stand in for any symbol except scatter. With the old-fashioned look and the Cash Stoppa extras, this game is definitely worth a shot for committed slot-lovers. It’s a shame you can’t get it on mobile devices, but most will probably find time for their computers.